But all is not lost for the sport which once commanded prime interest in the U.S. alongside baseball and even worldwide with soccer. With companies like Golden Boy Promotions and DiBella Entertainment still beating the drum, TV deals are still out there for boxing. Case in point: the most recent big announcement by Golden Boy, a multi-year agreement with ESPN for a series of bouts live on ESPN2 and ESPN Deportes, beginning with a card on March 23 in the Coachella Valley, California. Year one has 18 cards on the schedule in both English and Spanish in the U.S. and on affiliated networks in several of its international markets. 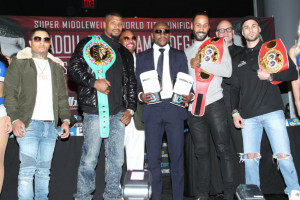 DiBella continues to promote fight nights on Showtime, with the recent January 14 card headlined by James DeGale’s super middleweight majority draw with Badou Jack keeping the sport fresh on one of boxing’s most important outlets. And while MMA has grabbed much of the young market and its digital eyeballs—and with that a growing set of mainstream sponsors, boxing hasn’t yet been counted out, as long as big media companies like Disney (ESPN) and CBS (Showtime) are still in the mix.